It is often necessary to help you with software problems in a quick and simple way. That is why we count on the Online Support. The Online Support enables us to access your system through remote maintenance and see what your system’s current problem is. By using this form of support we save your time, money, and most importantly we are enabled to give you direct and immediate help with your system. Certain safety measures will take place prior to the remote maintenance to prevent any misuse of the connection. The service technician asks you to visit our website to open the support tools. Thereafter, you will get a 9 digit PIN, which you will have to enter. Every PIN number can only be used once for the remonte maintenance and will be registered by us (date, length, name of the hotel, etc). The connection between the Onity computer of your hotel and the computer of the service technician establishes an extra safe system, almost like a tunnel, that is only usable from the Keyotel connection. 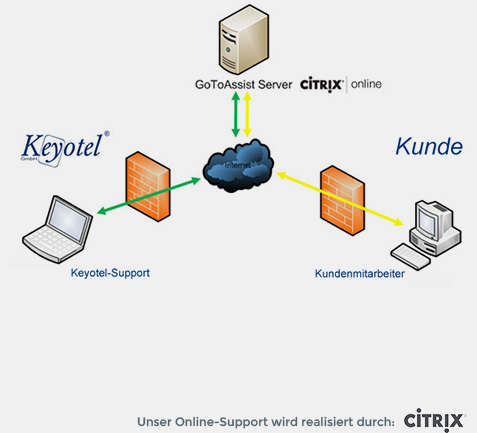 This service, which is provided by the company Citrix, is the basic part of our Online Support. Every incoming and outgoing data will be encoded, while additional mechanisms prevent any kind of external manipulation. If you need any technical support you can reach us by calling our service hotline. Smaller, less complicated problems can usually be fixed quickly. If your system’s problems prove to be more severe, and involve a bigger effort on our side, your support technician will point out that the following services will be charged. The support technician will also tell you about our current price list of the service hotline, which will evaluate the cost of your call. We naturally offer personal support at your hotel. Please ask us about our current service charge and agree on an appointment at your desired destination with our telephone costumer service. Here you can find Frequently Asked Questions about our products. In most cases you can find a simple and quick answer to your question on our FAQ page. If your question is not listed, please contact us. We are happy to help.